Cushion cut diamonds became more popular in the 18th & 19th centuries. At this time, cushion cuts were named as “candlelight diamonds” because of its ability to shine in candle light.Therefor it preferred by many diamond cutters. However, after the invention of electricity , the round brilliant cut took its place as the most popular diamond cut. Cushion cuts are making a big comeback now a days. A cushion cut diamond is commonly look like a pillow cut due to its resemblance to an overstuffed pillow. Its shape resembled between a rectangle and an oval and corners are rounded. For instance, when a diamond is cut right, the light is returned to the top of the diamond and a lot of sparkle shown. When the diamond is cut too shallow, the light escapes through the bottom. 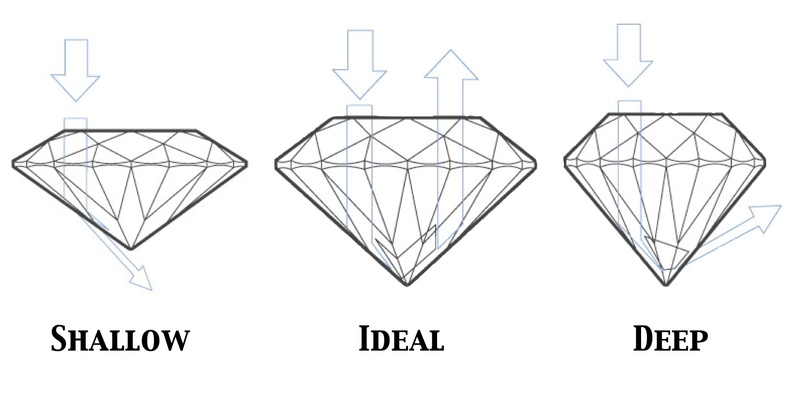 The light will leak out the sides when a diamond is cut too deep.